UPDATE (12/16): Running back James Conner (ankle) practiced limitedly on Friday but is officially doubtful and expected no to play. Right tackle Marcus Gilbert (knee) is out. Backup Matt Feiler will continue to fill in at right tackle. Roethlisberger suffered a rib injury that sidelined him for most of the second half against the Raiders in Week 14, but he’s expected to play this week. Although the Patriots are second in the league with a Pro Football Focus (PFF) coverage grade of 91.7, the Steelers have a number of factors in their favor. 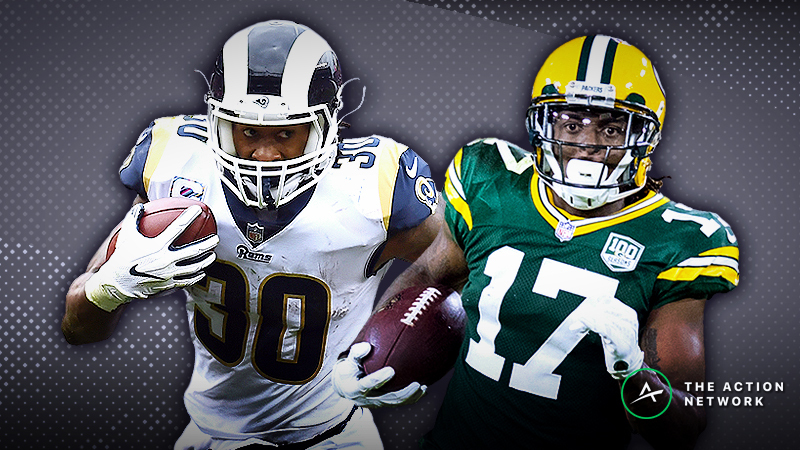 Based on our 2018 NFL Power Rankings, from a betting perspective the Steelers are the most underrated team of Week 15. On top of that, Steelers-Pats has a slate-high over/under of 52 points: Roethlisberger could easily find himself in a high-scoring back-and-forth, pass-heavy shootout. Since wide receiver Antonio Brown’s first All-Pro campaign in 2014, the Steelers have had a 16-6 over/under record at home against non-divisional opponents with Roethlisberger at quarterback, which has been good for a 40.9% return on investment for over bettors (per Bet Labs). Against teams that don’t have the benefit of playing them two times per year, the Steelers tend to put up points at home. With Brown in All-Pro form, Roethlisberger has been the league’s best home quarterback since 2014, exhibiting dramatic splits that make him a strong candidate for guaranteed prize pools anytime he’s at Heinz Field. At home, Roethlisberger has easily been the No. 1 fantasy quarterback on a cost-adjusted basis over the past half decade. His Consistency Rating at home is unrivaled among quarterbacks with more than a year’s worth of starts. When Roethlisberger is in Pittsburgh, he’s always in play. Although the Steelers have lost three straight games, Roethlisberger has averaged 313.4 yards and 2.29 touchdowns passing per game and completed 68.8% of his passes since the team’s Week 7 bye. He’s in fine recent form. And for the season, Roethlisberger is first in the league with 546 attempts passing. Under longtime quarterbacks coach and first-year offensive coordinator Randy Fichtner, Roethlisberger leads all quarterbacks with 576 dropbacks, and the team is first with a 67.2% pass rate. Maybe the Steelers have skewed toward the passing game this season simply because of the absence of running back Le’Veon Bell (contract dispute). Whatever the reason, Roethlisberger is on pace to smash his career-high mark of 608 attempts that he set in 2014, when he led the league with 4,952 yards passing. And with running back James Conner (ankle) expected to miss another game, the Steelers could skew even more to the passing game, given that rookie Jaylen Samuels is much stronger as a receiver (14-118-2 on 16 targets) than a runner (23-59-0), plus veteran Stevan Ridley hasn’t been a lead back in years. Even if they get ahead, the Steelers might choose to rely more on their franchise quarterback than their backup-filled backfield. Ironically, the biggest concern with Roethlisberger might be his 2018 connection with Brown. The two have been noticeably off this season. Over the four previous seasons, Roethlisberger had a stellar 9.3 adjusted yards per attempt (AY/A) on his 643 passes directed to Brown. That combination of volume and efficiency was otherworldly. This season, though, of any Steelers pass-catcher targeted at least 30 times by Roethlisberger, Brown has by far been the least efficient with his targets (per the RotoViz AY/A app). It’s hard to say with whom the blame lies for the abnormally low AY/A on Brown’s targets. It’s possible that Brown is falling off a cliff: By a number of metrics, this has been the least efficient season of his career, and there’s a case to be made that Brown is no longer a top-10 wide receiver. He’s surviving on volume and touchdowns — he’s second in the league with 142 targets and first with 18 end-zone targets — but as the book of Matthew says, man shall not live by bread alone. Regardless of where the fault lies in the Roethlisberger-Brown downturn, it’s undeniable to all but the most biased observers. Since 2014, quarterbacks have had a 0.52 correlation with their No. 1 wide receivers, and over that time the Steelers have enjoyed a transcendent 0.73 correlation between their quarterback and top receiver. But over the past 12 months, Roethlisberger and Brown have had a correlation of just 0.16 on DraftKings and 0.11 on FanDuel. This doesn’t mean that Roethlisberger and Brown won’t be able to have success in Week 15, but the Pats have been solid against wide receivers this season thanks to their top corners. Based on how the Pats have deployed their corners recently, it’s likely that Gilmore will shadow Brown on the outside while McCourty defends the dynamic JuJu Smith-Schuster in the slot with safety help. Using a similar coverage scheme against the Vikings in Week 13, the Pats held wide receivers Stefon Diggs and Adam Thielen to a combined 10-77-1 receiving on 16 targets. Both Brown and JuJu are talented enough to go off in any game — Brown has averaged 109.1 yards receiving and 1.03 touchdowns per game at home since 2014, and JuJu is the only player in the league this season with more than 1,000 air yards and 500 yards after the catch — but the Pats will do everything they can to neutralize them. And if Brown and JuJu are unable to get anything going, Roethlisberger will likely struggle. Even so, Roethlisberger has a position-high nine Pro Trends on DraftKings, where he’s the No. 1 quarterback in the Raybon Model. The Falcons’ 4-9 record has partially obscured Ryan’s resurgence: He hasn’t regained his 2016 MVP form, but Ryan is third in the league with a 70.5% completion rate and 4,076 yards passing. His 8.7 AY/A is the second-highest mark of his career. And Ryan has quietly been one of the league’s most consistent quarterbacks since wide receiver Julio Jones entered the NFL in 2011. In each of the past eight seasons, Ryan is the only quarterback to throw for 4,000 yards. Since 2011, only Saints quarterback Drew Brees has passed for more than Ryan’s 35,811 yards. If not for a second-half Super Bowl collapse two years ago, Ryan would be a borderline Hall of Fame candidate a decade from now. Averaging 26.2 DraftKings points and a +8.72 Plus/Minus in his seven home games this season, Ryan has been better than most people realize. But he’s not in a great spot this week. 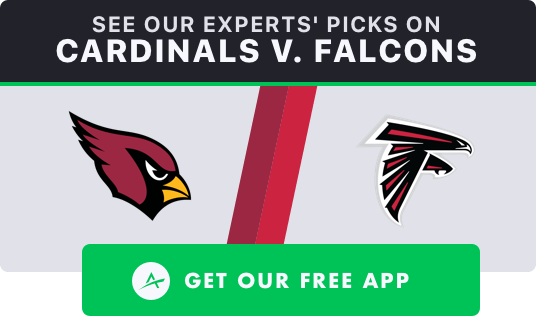 It’s theoretically good for him to be a home favorite, but the Cardinals are 10th against the pass with a 0.6% mark in Football Outsiders’ DVOA, and they have “held” quarterbacks to a bottom three mark of 15.9 DraftKings points per game, primarily because teams have gotten big leads against them and chosen to run the ball. Ryan doesn’t have a particularly good matchup anyway, and he’s at risk of being game-scripted out of the contest if the Falcons get a blowout victory. … most of that production came outside of Peterson’s coverage: For the season, he’s allowed a catch rate of just 54.3% and a 25-279-2 receiving line on 510 coverage snaps. If the Cardinals let Peterson truly shadow Jones, that will diminish his odds of having a big game. And if Julio doesn’t go off, Ryan will likely have a mediocre performance. 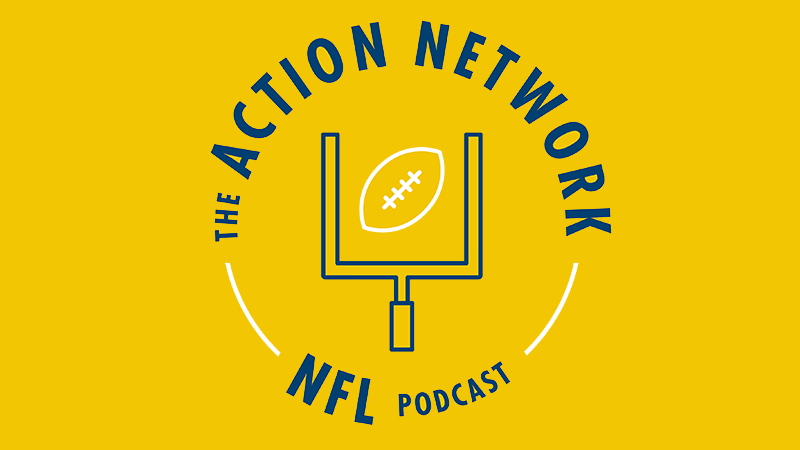 On Wednesday’s edition of The Action Network NFL Podcast, we talked about how most of the slate’s expensive quarterbacks have elevated risk: Ryan has position-high ceiling and floor projections on DraftKings, but he also has the potential to underwhelm. On the one hand, it’s possible that the Falcons could underperform, as they have for most of the season. On the other hand, it’s possible that they could easily win without needing a big game from Ryan. There are several avenues through which Ryan can reach Bust Boulevard. 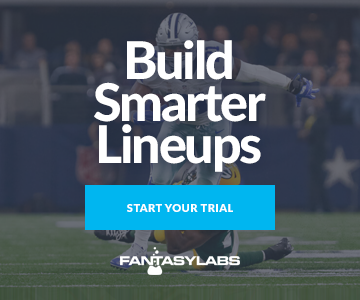 If you’re looking to roster him in GPPs, use our Lineup Builder to stack Ryan with wide receiver Calvin Ridley. With Peterson on Julio, it’s likely that Ridley will run most of his routes against a combination of cornerbacks David Amerson and Bene Benwikere, both of whom have poor PFF coverage grades lower than 55. Last week, Ryan and Ridley had a shared ownership rate of just 0.78% in the DraftKings Millionaire Maker, and Ryan has a personal-high 0.82 correlation with his rookie wide receiver. With a top two Bargain Rating of 98%, Ryan is the No. 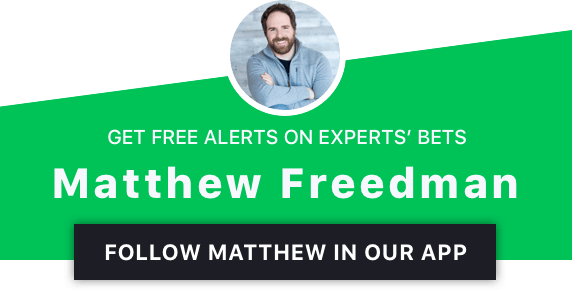 1 DraftKings quarterback in the Freedman Model. UPDATE (12/16): Steelers safety Sean Davis (knee) and edge defender Anthony Chickillo (ankle) will play after practicing in full on Thursday and Friday. Including the playoffs, Brady has faced the Steelers five times over the past five seasons, most recently in Week 15 of 2017, when the Patriots controversially won in the final minute. 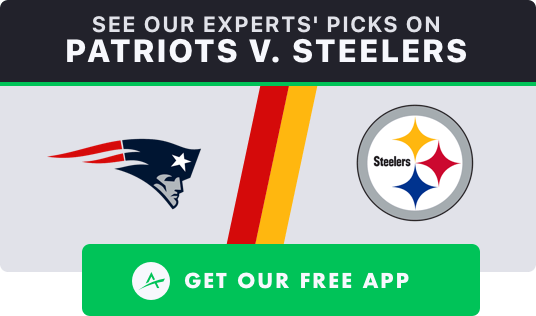 For two teams not in the same division, the Pats and Steelers know each other as well as any teams can. There are a few factors working against Brady this week. For one, he has tended to underperform in the second half of the season over the past half decade. On top of that, he’s also been markedly better at home over that span. When he’s played on the road in the second half, the results have usually been unsatisfactory. Last season, Brady had just 16.7 DraftKings points when he played the Steelers at Heinz Field. But maybe this week Brady will buck his second-half road trend. Just last week, Brady put up 29.6 DraftKings points on the road against the Dolphins with a 358-yard, three-touchdown performance. And since last season (including playoffs), the Steelers defense has been significantly worse without Pro Bowl inside linebacker Ryan Shazier (back). The Steelers have something of a funnel defense, ranking seventh against the run (-14.5% DVOA) but 21st against the pass (9.9% DVOA). Given that the Steelers-Pats game features the slate’s fastest combined situation-neutral pace, Brady could find himself throwing a lot of passes against an exploitable defense. And what Brady really has going for him this week is the combined presence of wide receivers Josh Gordon and Julian Edelman, tight end Rob Gronkowski and running back Sony Michel, all of whom Brady has been without for at least two games this season. When the Patriots offense has its full assortment of skill-position players, Brady has been at his best. On Sunday morning, I will probably look to bet the over on Brady’s yardage prop. With the aforementioned quartet of players, Brady has never failed to pass for at least 277 yards, and he’s had at least 340 yards in three of six games. Brady is the No. 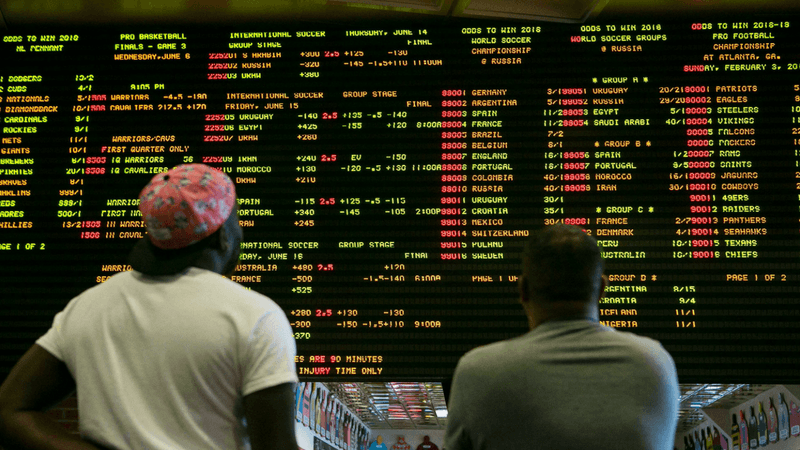 1 DraftKings quarterback in the Levitan, Koerner and SportsGeek Models. The spread opened at -8.5, but it has moved toward the Bucs even though they have gotten only 42% of the tickets. This reverse line movement suggests that some sharp money is betting against the Ravens, which theoretically doesn’t bode well for Jackson, but his fantasy-friendly rushing role ensures that he’ll put up points regardless of game script. With Jackson as the starter, the Ravens own a 3-1 record and have looked like the AFC North version of Tim Tebow’s 2011 Broncos. 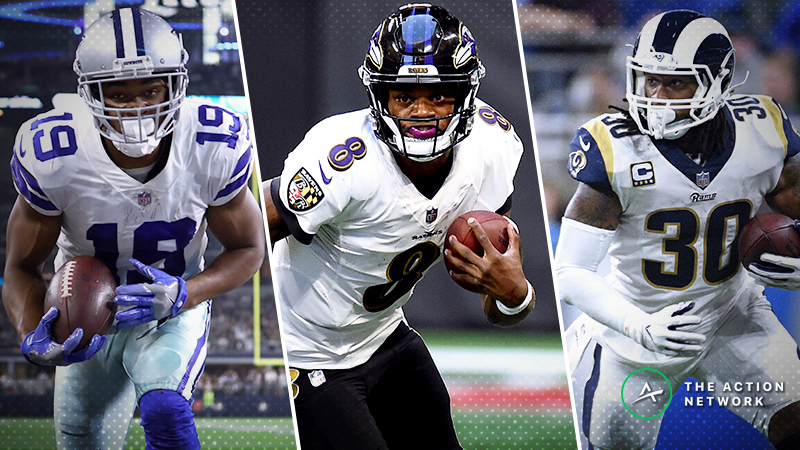 With a run-heavy, ball-control offense and top-three DVOA defense, the Ravens have transformed themselves into a hard team to beat. 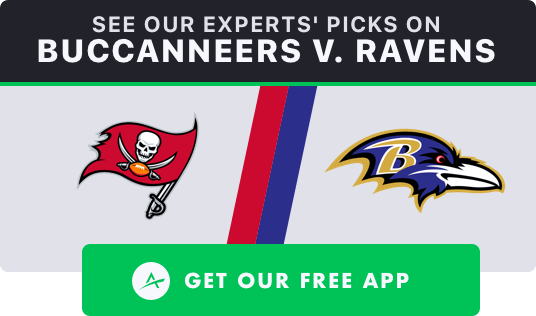 Recently declared the full-time starter by head coach John Harbaugh, the explosive first-round rookie has a real chance to lead the 7-6 Ravens to the postseason. There’s nothing pretty about how Jackson has played over the past month. He’s thrown three interceptions and fumbled six times. He’s managed just 150 yards and 0.75 touchdowns passing per game. His 5.9 AY/A is brutal. But as a runner, he’s dominated opponents with a 67-336-2 stat line, and he’s had at least 10 rushing attempts in every start. He’s in full-on Konami Code mode. The Bucs rank dead last in the league with a 61.2 PFF rush-defense grade, and they’ve been especially poor on the road. They’re 30th in the league with 29.5 points per game allowed. Middle linebacker Kwon Alexander (knee, injured reserve) is out, as is backup middle linebacker Jack Cichy (ankle, IR). Cornerback Vernon Hargreaves (shoulder, IR) is out. Rookie cornerback Carlton Davis (knee) exited Week 12 early and missed Weeks 13 and 14. Strong safety Chris Conte (knee, IR) is out. Free safety Justin Evans (toe) missed Weeks 11 and 12, tried to play in Week 13 and managed only 35.7% of the defensive snaps: He sat out last week and is uncertain for this week. And backup free safety Isaiah Johnson (concussion) suffered a head injury in Week 13 and missed Week 14. He might not clear the league’s protocol in time to play on Sunday. Against such a defense, Jackson could dominate. The Bucs have allowed a top five mark of 23.0 DraftKings points per game to opposing quarterbacks. Regardless of how the game script unfolds, Jackson’s rushing ability gives him a high floor. In his four starts, he has a position-high 10.1 expected fantasy points as a runner and has hit his salary-based expectations in each game with an average of 19.9 DraftKings points per game. In GPPs, Jackson is very stackable with the Ravens defense, and he also might be roster-able with wide receiver Willie Snead: Jackson has targeted him a personal-high 20 times, and Snead has a strong price-adjusted combination of consistency and upside. Jackson is the No. 1 DraftKings and FanDuel quarterback in the Bales Model. If you’re looking for a cheap quarterback, Driskel might be your guy. He won’t be anywhere near a lineup of mine, but the Raiders rank dead last in pass defense (31.1% DVOA), and Driskel will have an ownership rate approaching 0%. While he hasn’t done much as a runner (5-15-0) in his first two starts, Driskel does have the ability to scramble: As a senior at Louisiana State in 2015, he rushed for a 92-323-5 stat line in 13 games, and as a sophomore at Florida, he rushed for 118-413-4 in 12 games. Driskel has averaged 203 yards and one touchdown passing per game in his two starts. 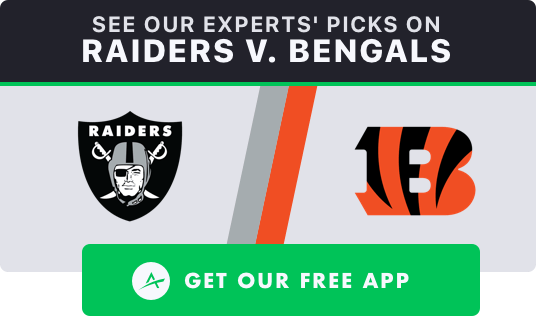 Those numbers aren’t great, but the Raiders have allowed quarterbacks to throw a league-high 30 touchdowns, and Driskel has some explosive pass-catching weapons in wide receivers Tyler Boyd and John Ross, running backs Joe Mixon and Giovani Bernard and tight end C.J. Uzomah. As uninspiring as Driskel is, he has the potential to put up 25-plus fantasy points as a home favorite against the Raiders. Driskel leads the position with his 62% Bargain Rating on FanDuel, where he’s the No. 1 quarterback in the CSURAM88 Model.